Getting dinner on the table as fast as possible with the least amount of effort (but with the maximum amount of flavor) is my mission as a mom. Since potatoes are inexpensive, healthy and, of course, delicious, they help make my job that much easier. These Herb Garlic Roast Potatoes are a fail safe recipe that I guarantee will join your weekly rotation of favorites! 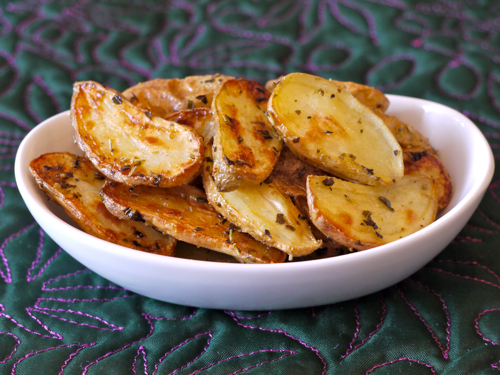 The zip of the garlic powder and dried herbs really pull together the creamy inside and crunchy outside of the potato. They're the perfect accompaniment BBQ chicken, fish, steak, burgers or any meal you may be planning for the holidays. I love them right out of the oven, but they're also great to serve warm and make awesome leftovers. Easy? Mission accomplished! 2. Toss the potatoes with the olive oil, salt, garlic powder and herbs on a sheet tray. 3. Bake for 40 minutes or until the potatoes are golden on the exterior and tender inside. Sounds like an amazing dish and such an easy recipe. Do you think it would be any different if I was to toss everything together in a zip lock bag and then dump it on the pan to cook? Nope, it would be just the same! Can I use regular potatoes for that as well? Fingerling potatoes are sometimes hard to find where I live. Could I use redskins or baby yukon golds perhaps? Ooh, I'm going to try this soon! But at first blush: Smiley and Jill, something tells me you can get away with just about any potato you like. Baby Yukon golds would probably be really good! Darcy: I like the Ziploc bag idea better than tossing them in a bowl. Easier to contain the mess and one less thing to wash later! had them for dinner, turned out great, used russet potatoes cut in wedges. thanks for the recipe. Roasted potatoes are a favorite around here. Can't go wrong! I couldn't find \"Italian Herbs\" in Whole Foods. Is it a mix or do you mean something else? I tried this and used fresh oregano, basil, and tarragon and it was delicious. Thanks for the recipe! Just made these with dinner tonight and my 13mo old is cramming them in her mouth faster than I can put them on her plate! She loves them. love it but could you use a different oil? We've made these twice now, using regular vegetable oil and doubling the garlic (we love garlic around here!!). Delicious, and easy! I didn't have garlic powder, so thought I would chop some garlic cloves. Yet, in the end, I just added a bit of garlic paste.But it came out delicious. My little one gobbled up one entire piece! I was surprised! So glad I tried this recipe tonight. Tasty and easy. I've not had luck in the past with roasting potatoes but think the small size made this a winner. My 14 mos didn't care for them but my 3yr old liked them along with a happy hubby! I am preparing for a birthday BBQ - and thought these would be great. I'm wondering if I can roast at home for 30 minutes instead of 40 - put them in tin foil and bring them to the BBQ. If needed I could put them on the side of the grill to warm them a bit more, but I'm assuming they would continue cooking in the tin foil.... any thoughts? I don't want them to end up soggy. I would cook them for 30 minutes, like you said, then let them cool before packing them. If you pack them hot that's what will make them soggy. Then reheat on the grill like you said! Can i use a baking dish for this to get the same. I only have a roaster. It's a second hand oven so no baking sheet. Sadly for me.